A holiday salad that’s full of unique flavors and texture! 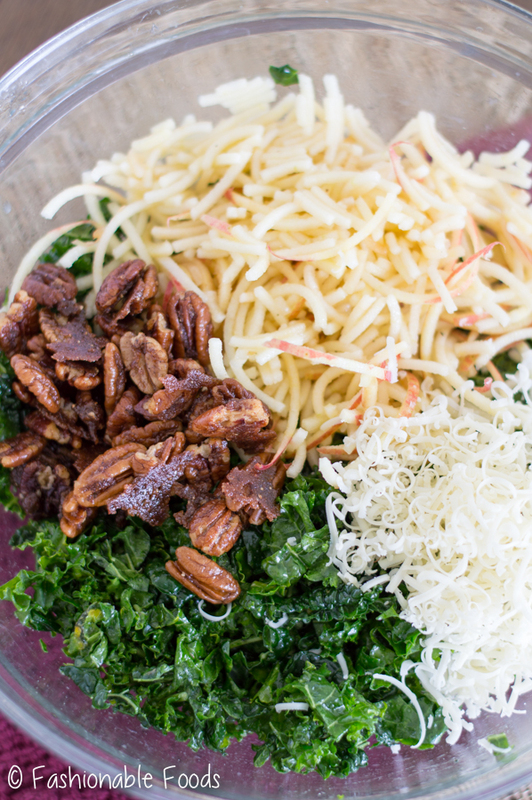 This spiralized apple, kale, and cheddar salad is tossed, homemade spiced pecans, and a delicious apple cider vinaigrette. It’s the perfect salad for your holiday meal! It’s December 12th, guys. DECEMBER 12th. That means we are LESS THAN 2 weeks away from Christmas. Why, oh why does the holiday season go by so fast?! I really can’t complain and say that I’m not ready, because I am.. I’d just prefer time to slow down a little bit! Did you guys have a nice weekend? Mine was fun, but still productive. Kyle and I picked out tiles for our backsplash DIY project (? ), hung out with our neighbors, and then went to a neighborhood cookie swap Sunday afternoon. We seriously have the best neighborhood ever, by the way. We haven’t even lived here for a year, but have become so close with our neighbors! It’s so nice to have such friendly people around that are always willing to lend a hand. Ok, back to Christmas being less than 2 weeks away! I’ve been putting the final touches on my holiday menu and today’s recipe is definitely going to be making an appearance! It’s no secret that I’m obsessed with kale. I eat kale salads just about every day.. my favorite way is with a little lemon, olive oil, some sort of nut, parmesan, and then whatever veggies I have in the fridge. Recently I picked up fresh apples and fresh made apple cider from my favorite local farm and I knew I’d be incorporating both into a kale salad! Spiralized apple, kale, and cheddar salad with spiced pecans and apple cider vinaigrette is THE BOMB. 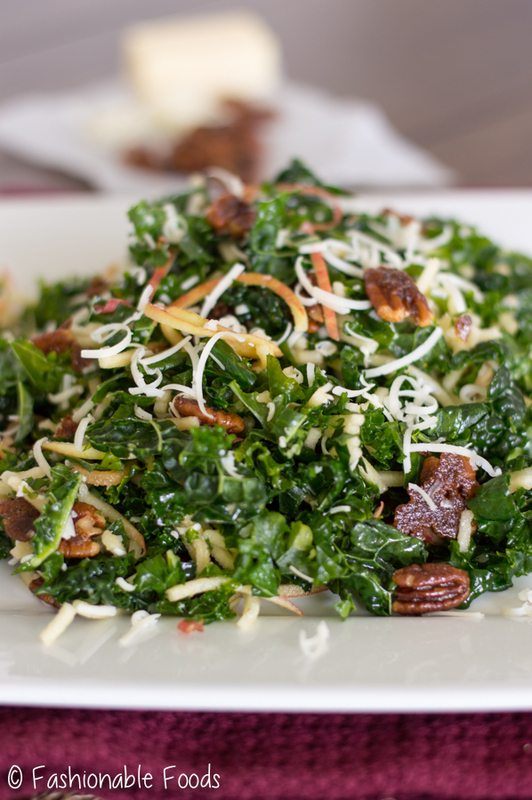 If you aren’t obsessed with kale yet, you will be after this one! PLEASE use a good quality cheddar! Apple and cheddar is a match made in heaven, but this isn’t the time to grab a bag of pre-grated orange cheddar cheese. Take a gander through your grocery store’s specialty cheese section and pick out a nice block of white cheddar there. You can assemble this salad ahead. In fact, the kale gets even better after it sits with the dressing. To make it ahead, you’ll want to complete the recipe up to the kale massage step. At that point, cover it with plastic wrap and refrigerate for up to 2 days before serving. You can store the dressing in the fridge and the spiced pecans in an air-tight container at room temperature. When you’re ready to serve, spiralize the apples and toss the salad together. I like to add cayenne pepper to my spiced pecans because I love the added heat, but if you aren’t into that, you can simply omit it. 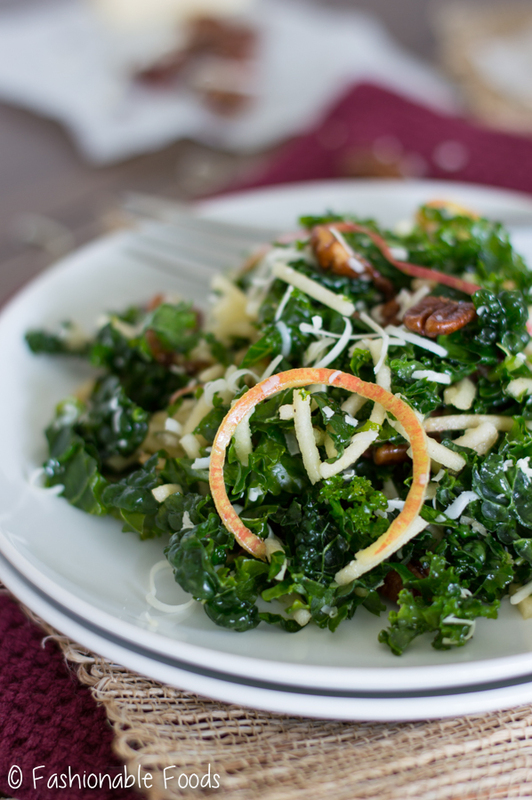 If you’re looking for a fun salad to add to your holiday table, you’ll love this spiralized apple, kale, and cheddar salad! 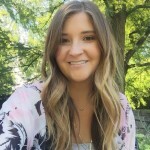 Oh, and are you following me on social media? If not, I’d love it if you did… Facebook, Instagram, and Twitter. Thanks for putting up with that little plug ? 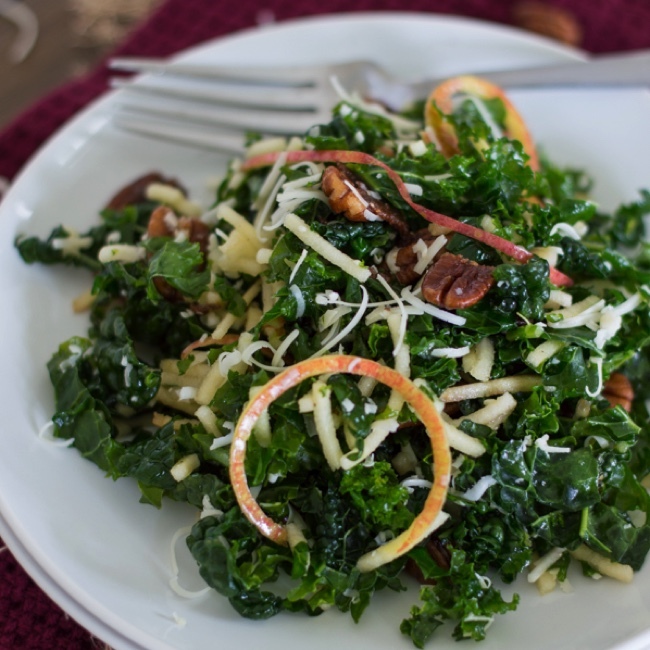 This spiralized apple, kale, and cheddar salad is tossed, homemade spiced pecans, and a delicious apple cider vinaigrette. 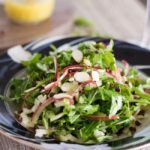 It’s the perfect salad for your holiday meal! Melt the butter over medium-low heat in a 10-inch sauté pan and add in the sugar and all the spices. Cook the mixture until the sugar melts and the spices are fragrant; about 30 seconds. Toss in the pecans and cook until the nuts are well coated in the sugar/spice mixture and smell nutty – about 2-3 minutes. Be sure to stir constantly to avoid burning! Pour the nuts in one layer onto the parchment covered baking sheet and set aside to cool completely. Make the vinaigrette by adding the apple cider, vinegar, and mustard to a small mason jar. Screw the lid on tightly and shake to combine. Next, add in the olive oil, a pinch of salt and pepper, and shake vigorously to combine. Taste and season the vinaigrette with more salt and pepper, if necessary. 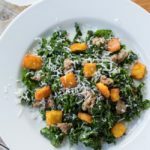 In a large bowl, massage the kale with 2 tablespoons of the dressing. To do this, simply take handfuls and squeeze – the kale will change color and wilt down slightly. Toss in the apples, cheddar, and cooled spiced pecans. Toss with another 2 tablespoons of the vinaigrette, adding more if necessary. Serve the salad topped with additional cheddar and have the dressing close by for drizzling! This salad will serve 6 as a larger salad portion, or 8-10 as a holiday side. *PLEASE use a good quality cheddar! Apple and cheddar is a match made in heaven, but this isn't the time to grab a bag of pre-grated orange cheddar cheese. Take a gander through your grocery store's specialty cheese section and pick out a nice block of white cheddar there. You can assemble this salad ahead. In fact, the kale gets even better after it sits with the dressing. To make it ahead, you'll want to complete the recipe up to the kale massage step. At that point, cover it with plastic wrap and refrigerate for up to 2 days before serving. You can store the dressing in the fridge and the spiced pecans in an air-tight container at room temperature. When you're ready to serve, spiralize the apples and toss the salad together. I like to add cayenne pepper to my spiced pecans because I love the added heat, but if you aren't into that, you can simply omit it. I really really like kale, but I haven’t reached obsession level yet.. so clearly I need to get on this salad, like yesterday! 😉 I love all the flavors you have going on here and that dressing sound freggin amazing!! 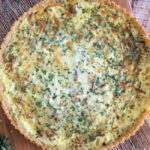 I’m totally adding this one to my lunch rotation this week!! On a side note, it’s really cool that your neighbors are so friendly!! We have lived here a year and an 1/2 and only met one neighbor, because his dog wondered into our yard on accident. Lol. But we really don’t live around that many houses, so? I’m jealous! Lol. Cheers, girlfriend! P.s. Yay to backsplash!!! I’m sure it is going to look great!!! Thanks, Cheyanne! I’ve been eating this non stop for lunch – I just can’t get enough. Nothing wrong with not having many houses around… isolation = quiet, which I’m also a big fan of! I can’t believe we are only two weeks away from Christmas! Where has the time gone?! I’m trying to savor every last holiday moment. This salad looks delicious, Keri! I love the cheddar and apple combo, and even better that the apples are spiralized! YUM! This sounds like the perfect, healthier meal to keep me on track for the holidays! I love the sound of spiralized apples. 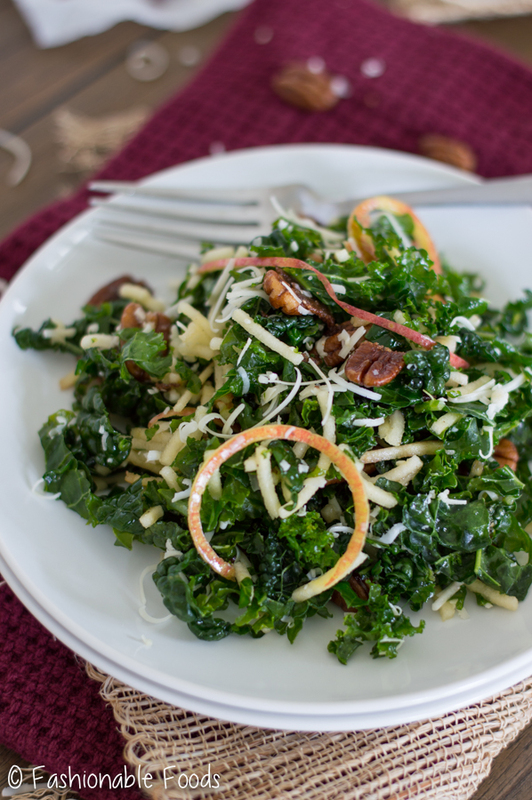 And I love that you shared this apple kale salad, Keri. I am planing to detox this week eating too many sweet stuff last week. And this salad sounds like a great dish to start with. Can’t wait to try this. YUM! This is such a pretty salad! Love the apple in here and I could eat a whole jar full of those pecans! Marvelous idea for including leafy green vegetables into the diet! I will definitely try this salad recipe!